One such destination in the last week was the Lindsay Prior National Arboretum. I have known of this site for over a decade and have known people involved with its establishment. I have to admit that the day we went there, given the presence over the road of the new National Arboretum, that is just a couple of kilometres from the National Botanic Gardens and the whole area around Black Mountain is dense bush land, what purpose is such an official arboretum now serving? Who goes there? Who is meant to go there? And what is happening? and lots of such queries. First some information: Lindsay Pryor (1915 – 1998) was an Australian botanist noted for his work on Eucalyptus taxonomy and his role in the landscape design of Canberra, including the foundation of the Australian National Botanic Gardens. 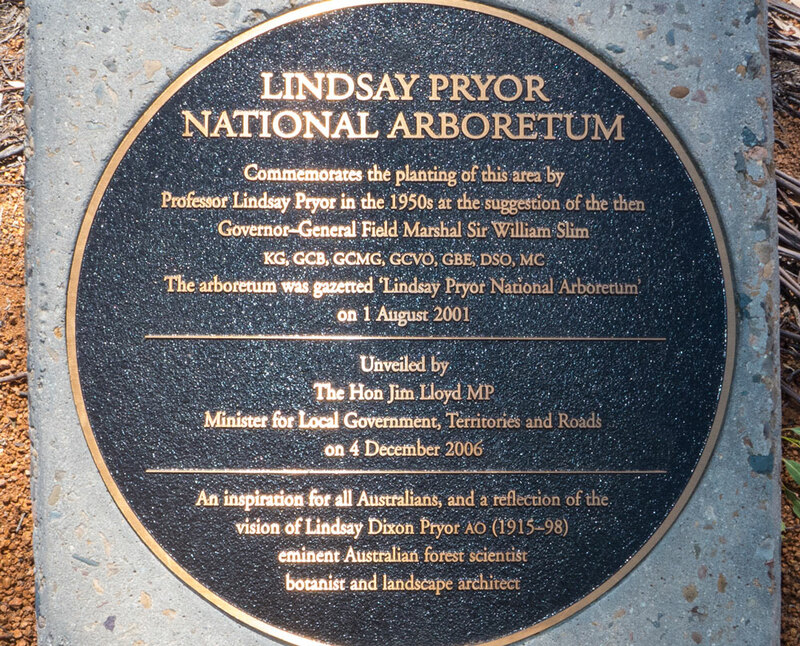 The Lindsay Pryor National Arboretum is an arboretum on the Yarramundi Reach peninsula in Canberra. It is located at the western end of Lake Burley Griffin. Trees of the arboretum were mostly planted 1954-1957 by Lindsay Pryor, at the time they planted 50 different species. The arboretum was damaged in the 2003 Canberra bushfires. It is also claimed that the site is used for research and recreation. It is good to remember those who were key to getting this place established. But in this case I am not so sure. All sorts of events and timing has resulted in a messy result. The first point is that too many people use spin words such a ‘national’ when establishing things in Canberra. I have seen national arts things as well as national monuments, that are really Canberra things in a city which happens to be the national capital. Yes the National Gallery and the like are authentically national, but as for this particular arboretum? I do not think so. It more accurately something put in place by the few people left who knew him. I suspect it would have been more appropriate to honour him in a bigger way at the National Botanic Gardens just up the road. Although I would also imagine that those who advocated for the naming in 2000/2001 were concerned that the arboretum would be neglected and that by having it attached to the name that surely more attention would be then allocated to maintenance etc. 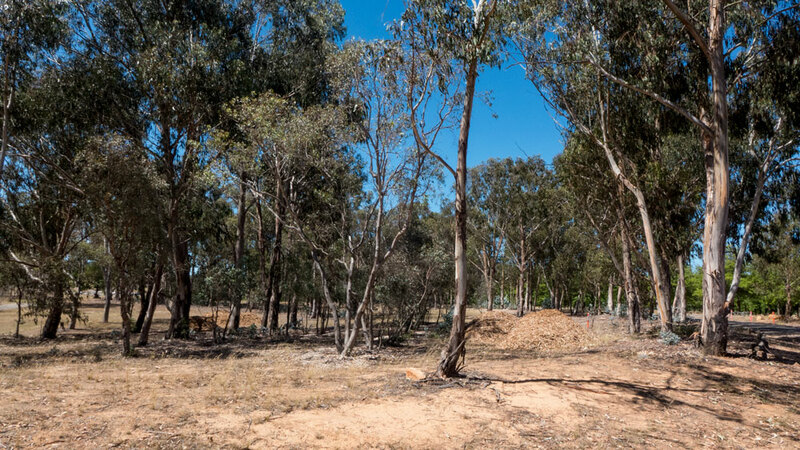 Since the devastating Canberra fires of 2003, that resulted in much damage to this arboretum, the National Capital Authority and ACT Governments have been slowly, maybe reluctantly, working to establishing this arboretum in some form of visitable site. I say reluctantly as work has been in progress for more than a decade and they are still doing master planning and design work. No urgency apparently. And then there is the other arboretum across the road. This one had full backing by the ACT Government and has been receiving much more profile and attention. This is more on that other arboretum to follow in a couple of days. The present site has been upgraded, fixtures changes as well as loads of wood chips have been delivered. But there’s still much more to be done for this site to be really worth a visit and to be taken seriously by the general public. 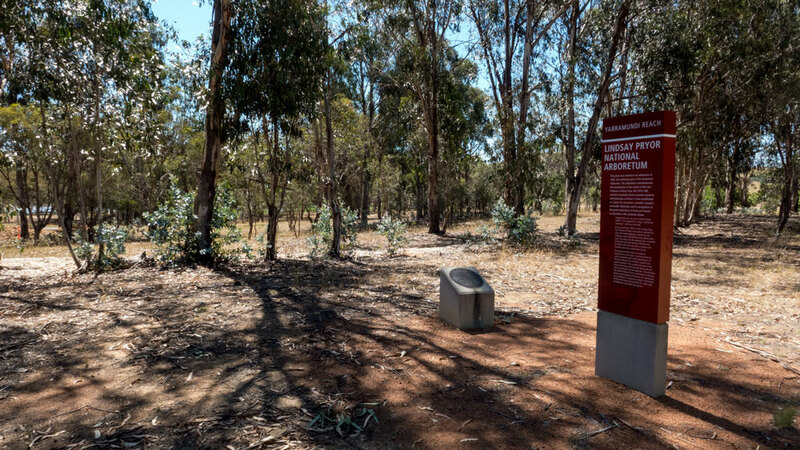 Somewhere in the documentation they talk about this arboretum being ‘an inspiration for all Australians and that this site is used for ‘recreation and research’. Again, I have failed to see the inspiration. It is an unfinished project. It has not much to offer except for the sign and the plaque – see the top photograph. Evidence of the special plantings remain. There are lines and clumps of particular species of trees. But the whole thing is very dry and not exactly inviting. And the site is accessed by a road which has a gate locked across it. I asked about the new work to establish a large car park complete with bus stops. I asked about who did they think was to arrive in such numbers. The two times I have been there, there have been a few locals going for a quick stroll with their dogs. That’s it. The crowds are over the road visiting the much larger and new arboretum. I used the term messy earlier. I say this as the original 1950s arboretum was put in place at the whim of the then Governor General to supply a better view from government house. I suspect it was in danger of neglect in the 1990s and the push was on to have it named, which happened in 2001. Then the fires of 2003 caused a severe set back. At the same time the pine forests across the road were destroyed and the decision was taken to invest in a large and significant arboretum on the hills that surround this original arboretum, now named the Lindsay Prior National Arboretum. 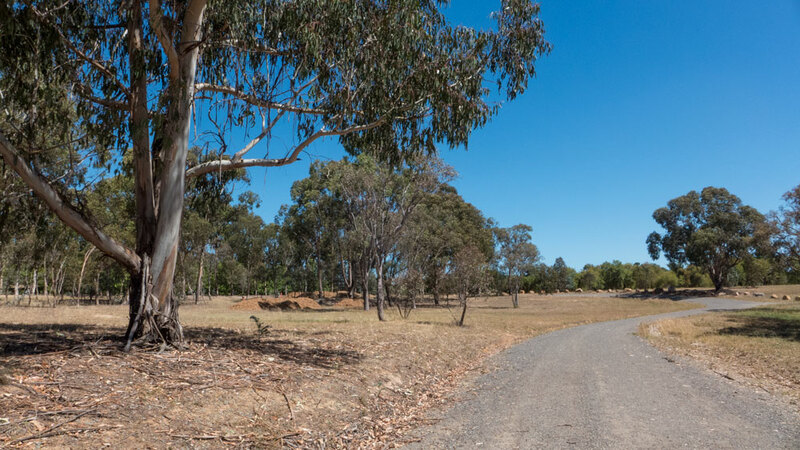 While millions were being spent over the road, the push continued to have the Lindsay Prior arboretum better recognised and upgraded. This took times but eventually the plaque was unveiled. But the site was still very much requiring loads of planning, design work, and therefore more money. All this while the attention on the big arboretum by the ACT Government was focused just across the road. Messy. Maybe one day the resources will be allocated to really bring it online as a tourist attraction. But I doubt it given the resources being allocated across the road and that project is one that will take decades to be finished (time for the plants to grow). Messy. The best, but probably not feasible, thing to do would be to somehow join the two and to have the two operate as one. Maybe a better link between the two and maybe the one by the lake, the Lindsay Prior Arboretum, could be altered to be a specialist area so that people visiting the greater arboretum could be encouraged to come down to the lake shore. Maybe even a ferry terminal so that people do not have to drive to the arboretums. A big picture response would be that arboretums such as this are no longer required. The suburbs and our whole cities are now the arboretums. This is where the experiments need to be happening to ensure we maintain and enhance the green infrastructure and biodiversity. We have moved beyond the 19th Century model museums of trees and shrubs. These separated sites are now longer relevant. Arboretums are now overdue to be archived in some curiousity cabinets. As for the Lindsay Prior (not so national) arboretum, not sure what can be done. This old fashion style arboretum is the very poor and overlooked cousin of the much larger National Arboretum on the hills behind. In its present form it is great to have the trees on site, but this style of isolated arboretum is not a priority when it comes to urban climate change adaptation. I suggest that a creative mind or two could have come up with a far better and more appropriate memorial to Lindsay Prior. It is a shame the proponents of this arboretum got this so wrong. All the best to the agencies who have to handle this as we deal with the ever-increasing demands on government budgets. I strongly suggest a new creative landscape design solution to have this smaller one linked into and maybe become the lakeside entrance to the ever-growing arboretum across the road. The arboretum now needs to include areas of food production. Food security is now an urgent issue to be addressed and this site provides opportunities to address this.